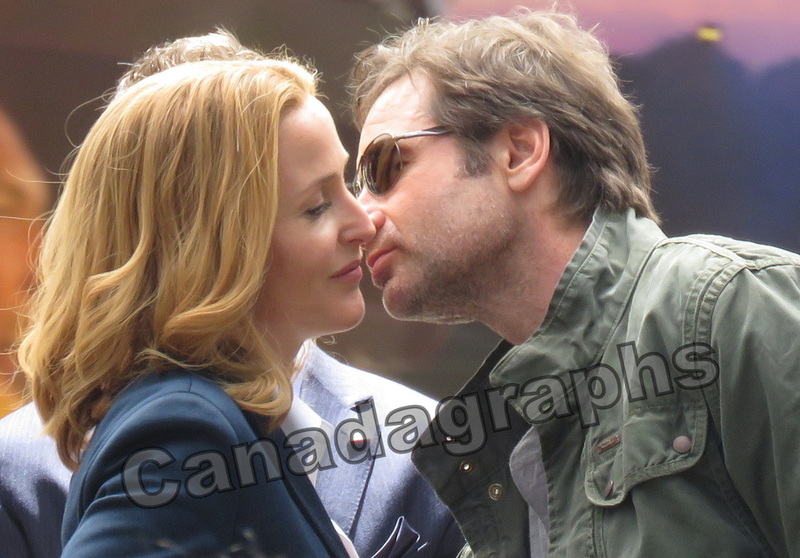 The X-Files revival series returns TONIGHT. 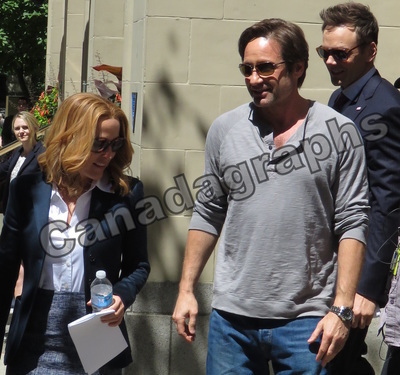 Here is a quick little clip of Mulder, Scully and Tad O'Malley filming a scene for the 1st episode. 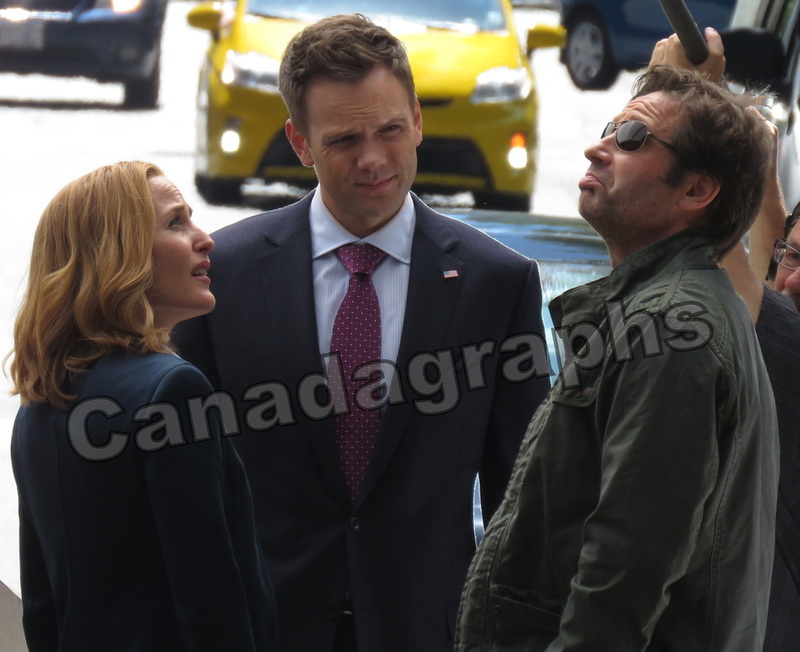 Tonight the return of 1 of the most talked about series of the 1990s returns.... and not some hokey remake with new people playing the parts. 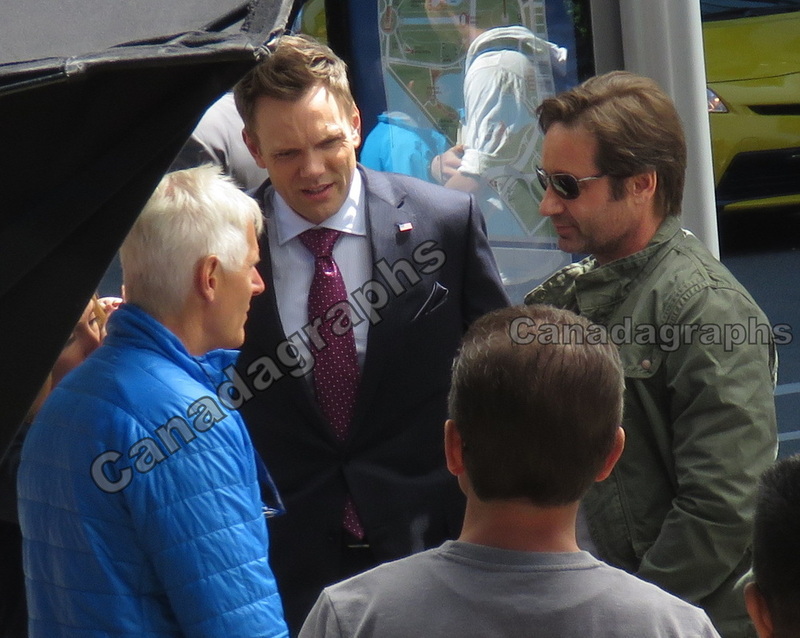 The original cast reprising their roles. 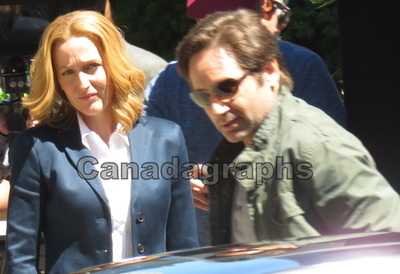 The X-Files returns. 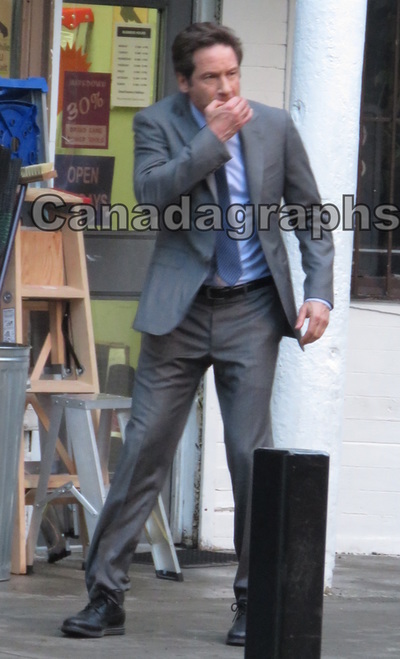 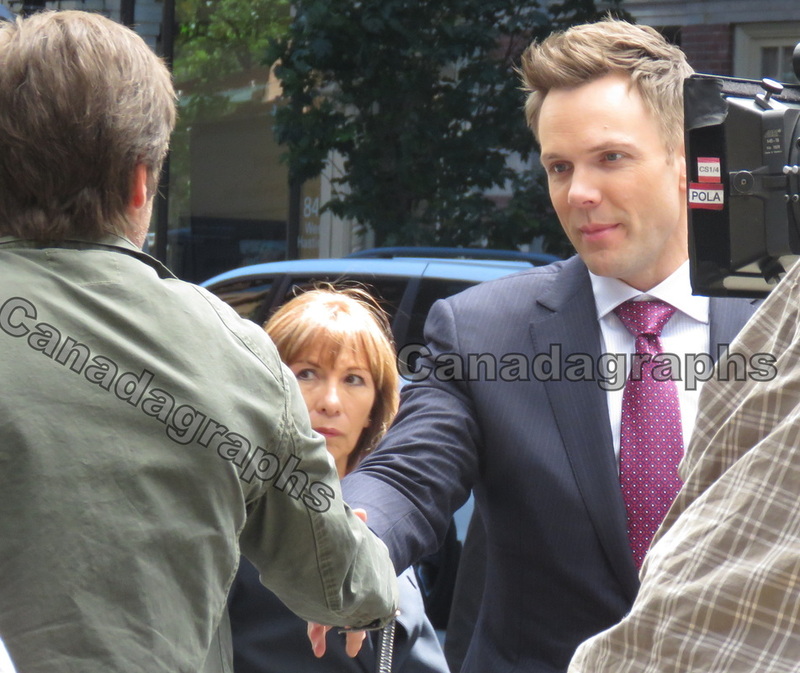 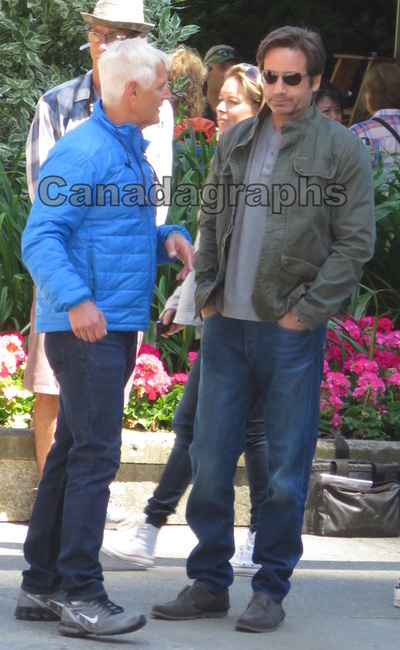 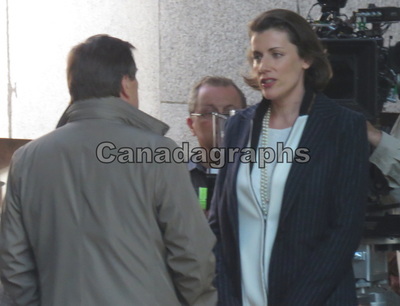 As you have seen from the couple previous blog posts I posted in here they did a few scenes in downtown Vancouver. This is the only video I have of 1 of their shoots. 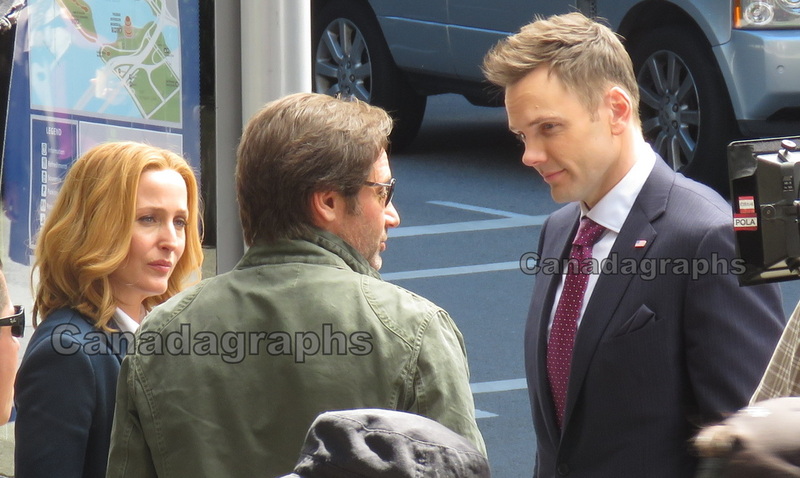 Its for the 1st episode with David Duchovny as Fox Mulder, Gillian Anderson as Dana Scully and Joel McHale as Tad O'Malley. 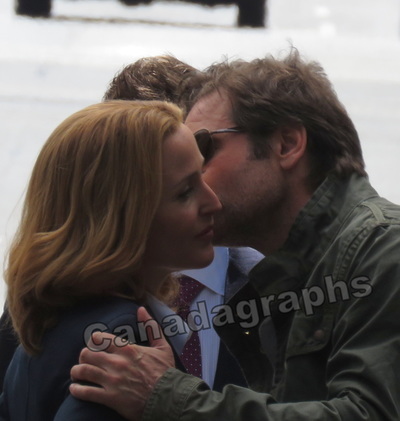 The X-Files returns TONIGHT on FOX. 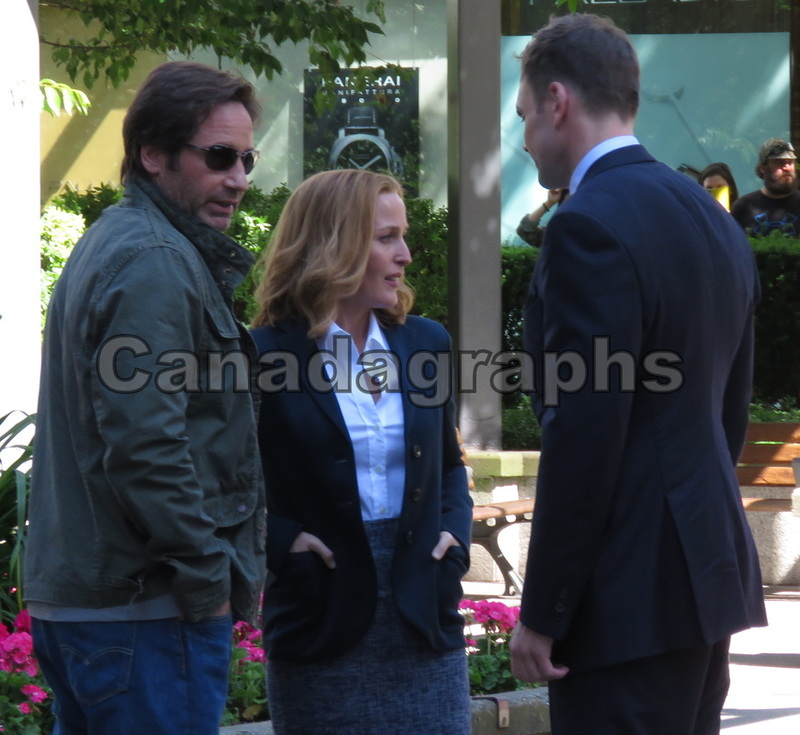 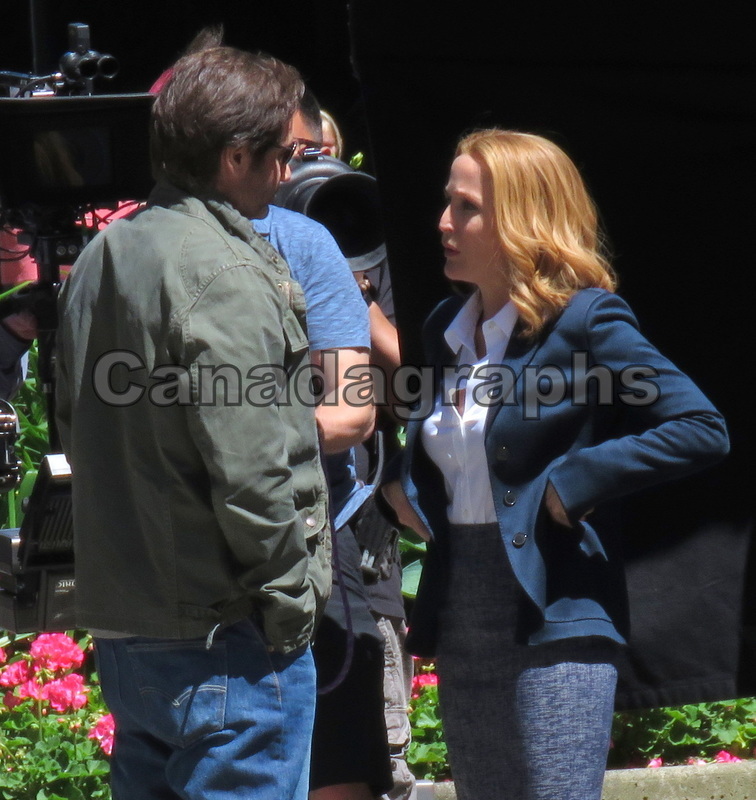 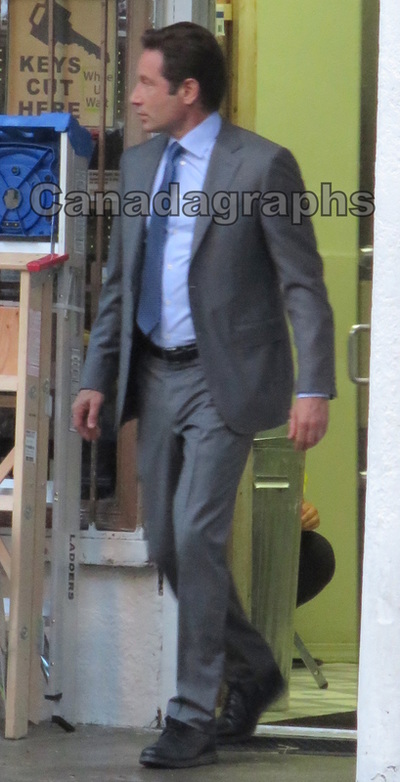 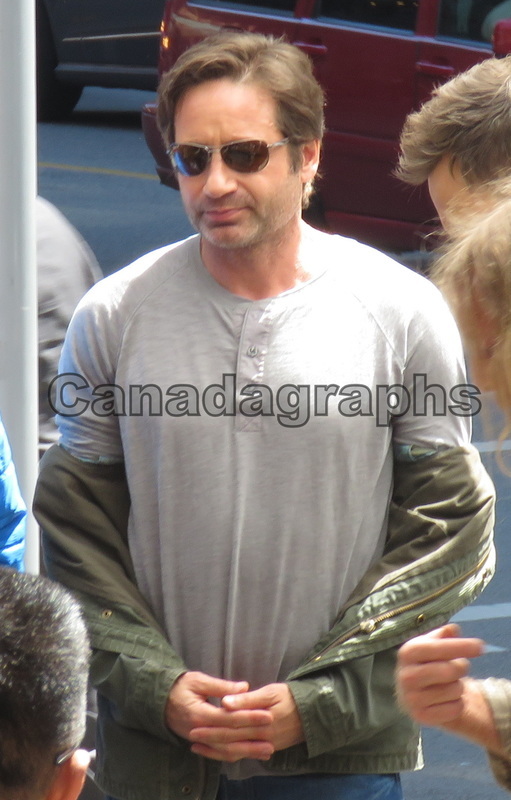 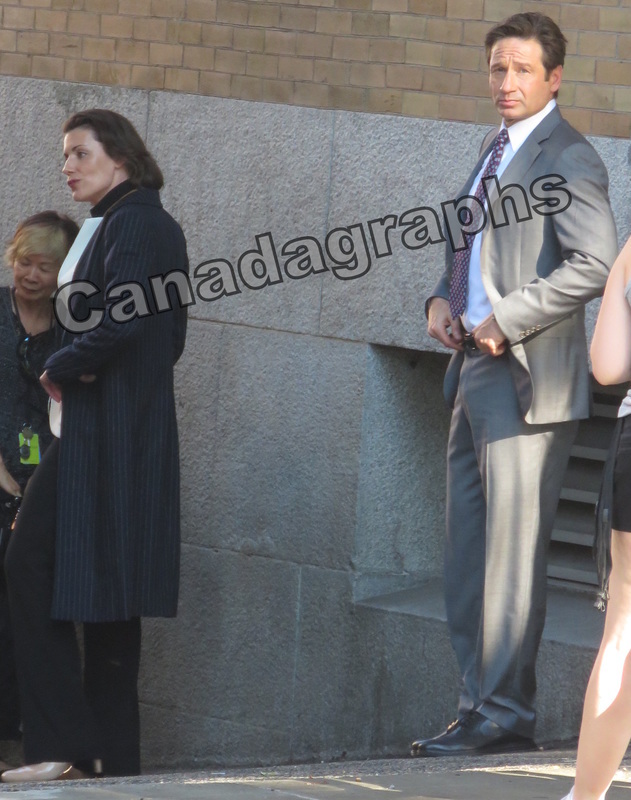 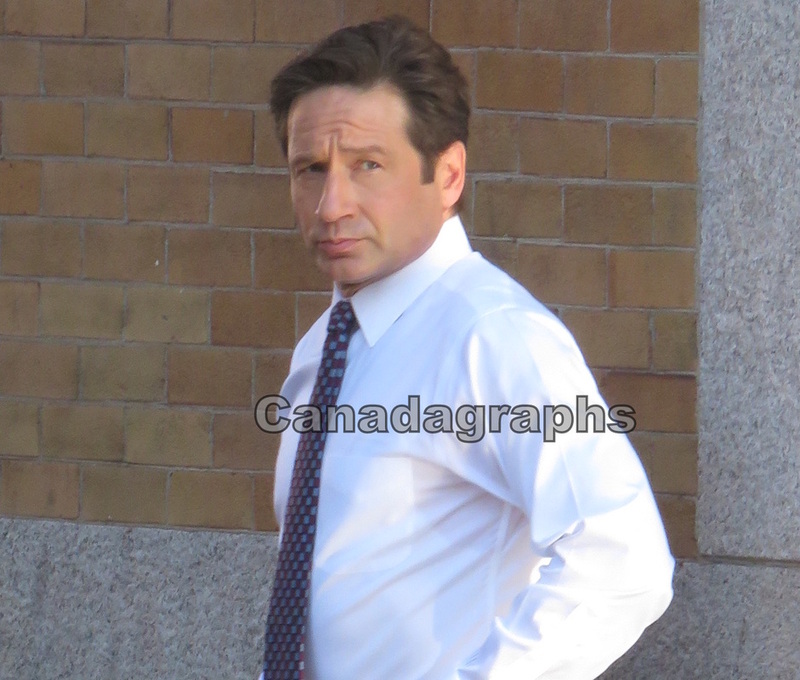 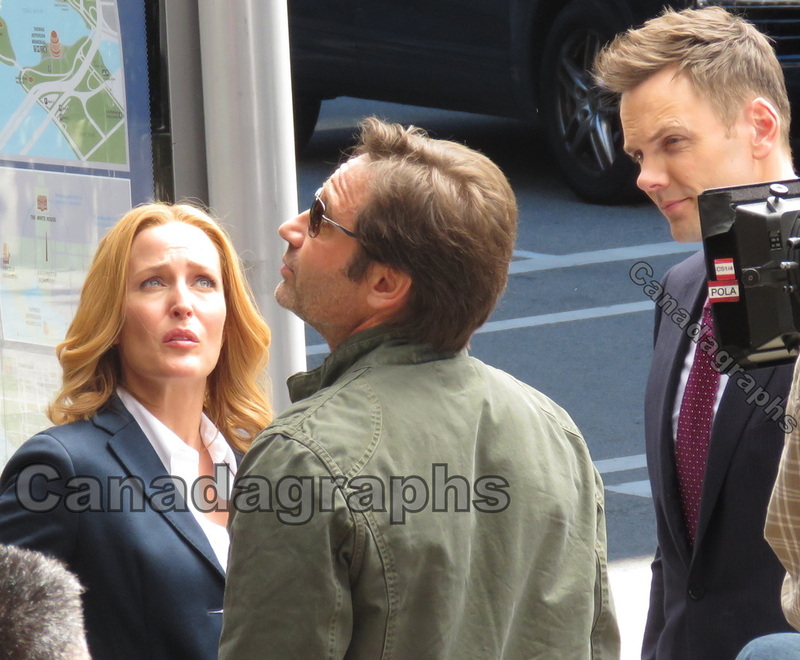 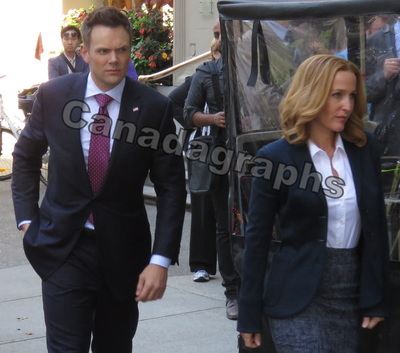 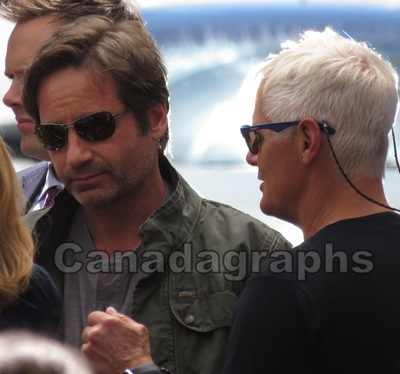 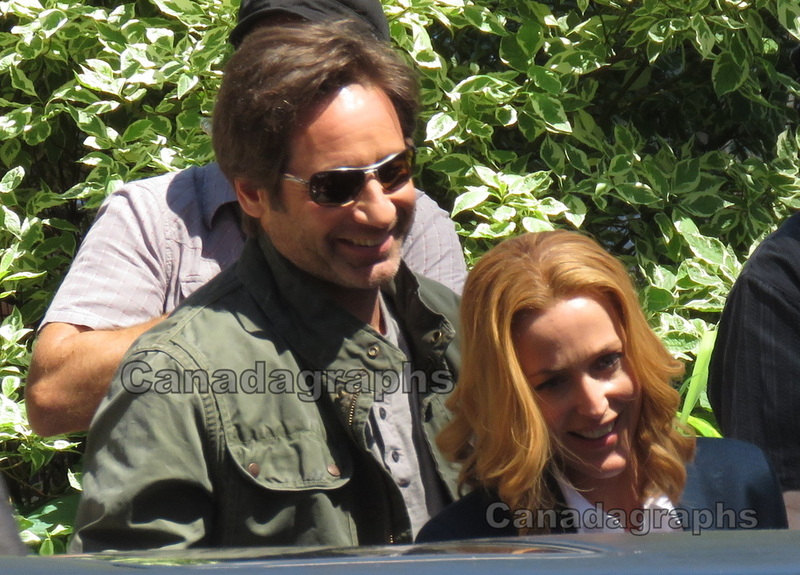 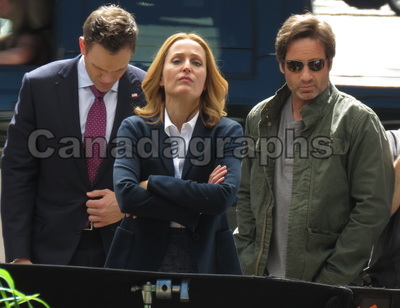 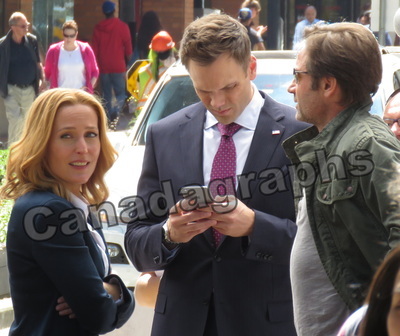 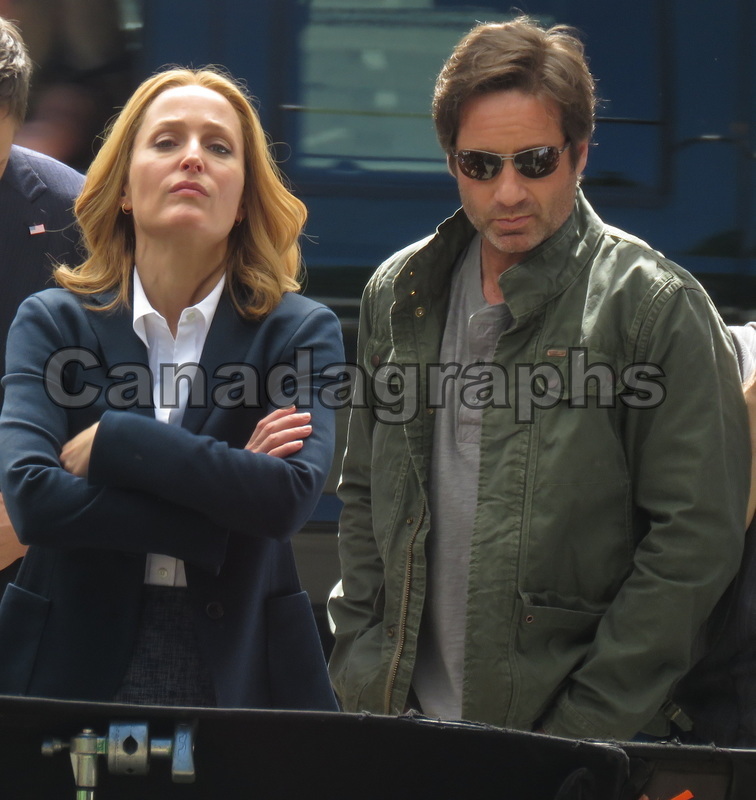 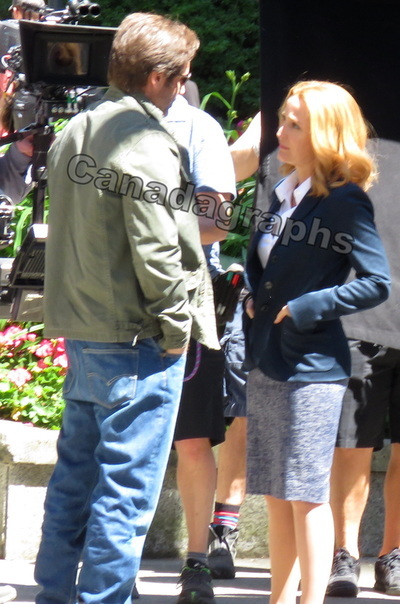 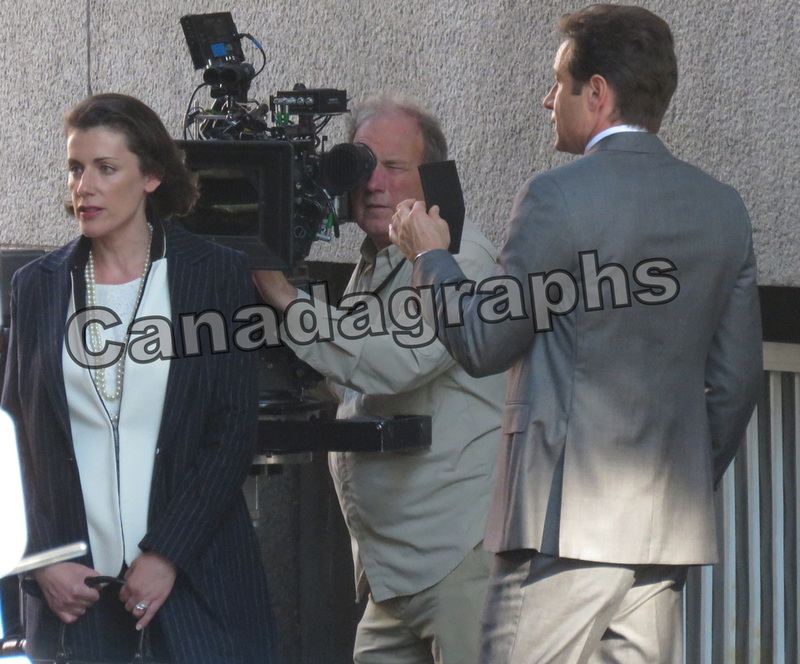 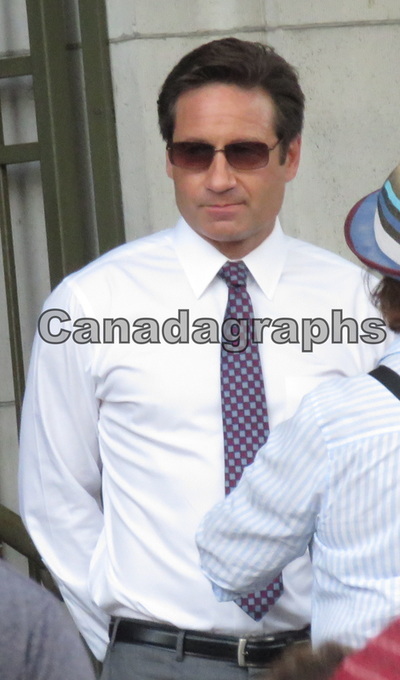 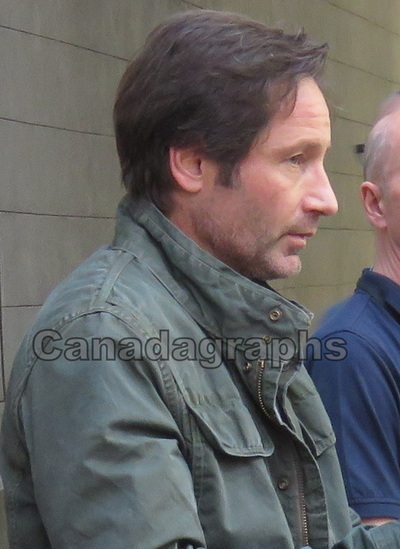 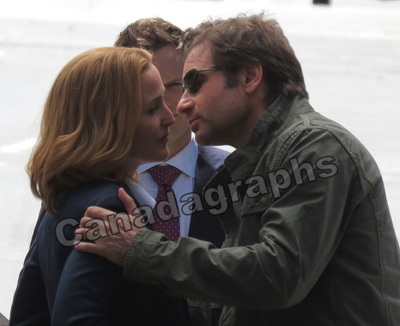 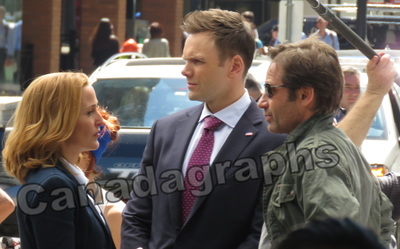 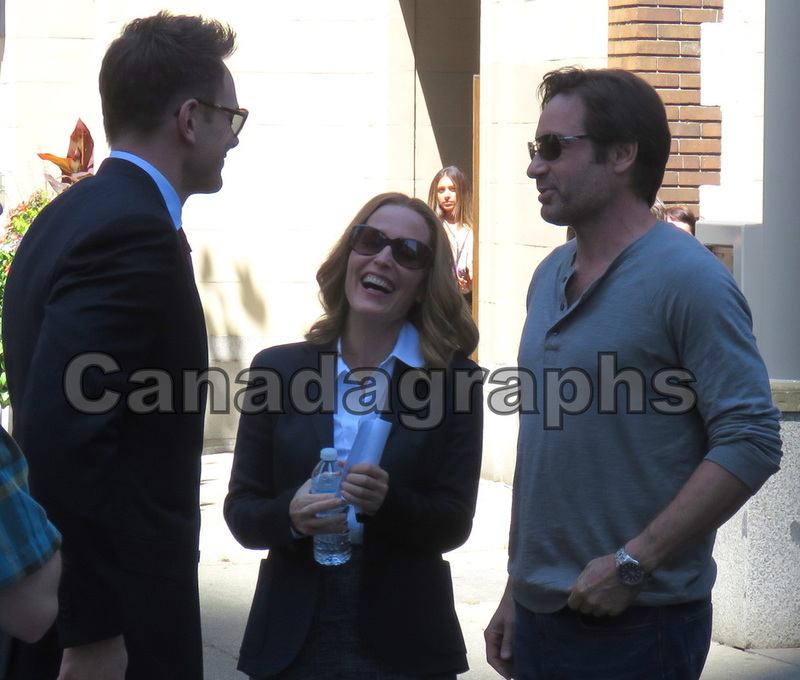 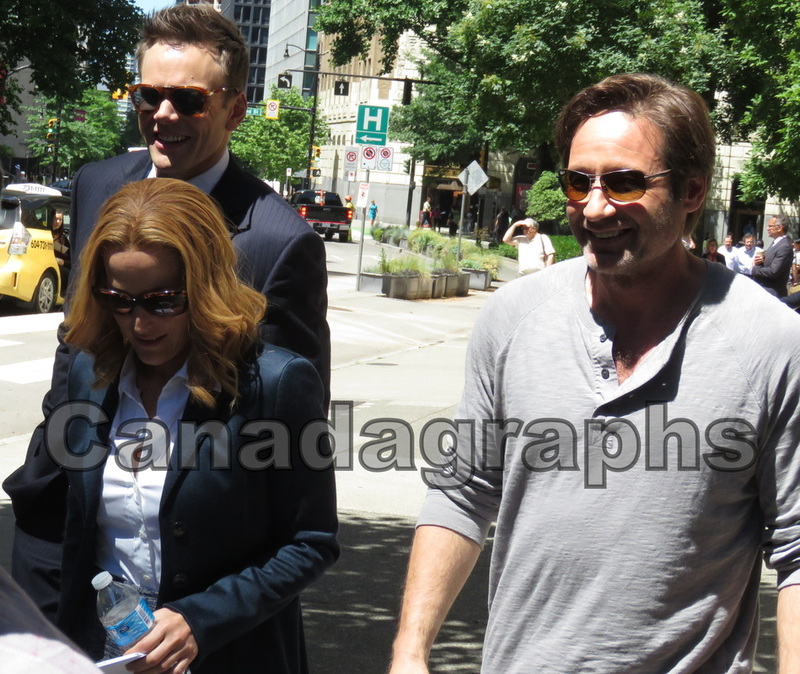 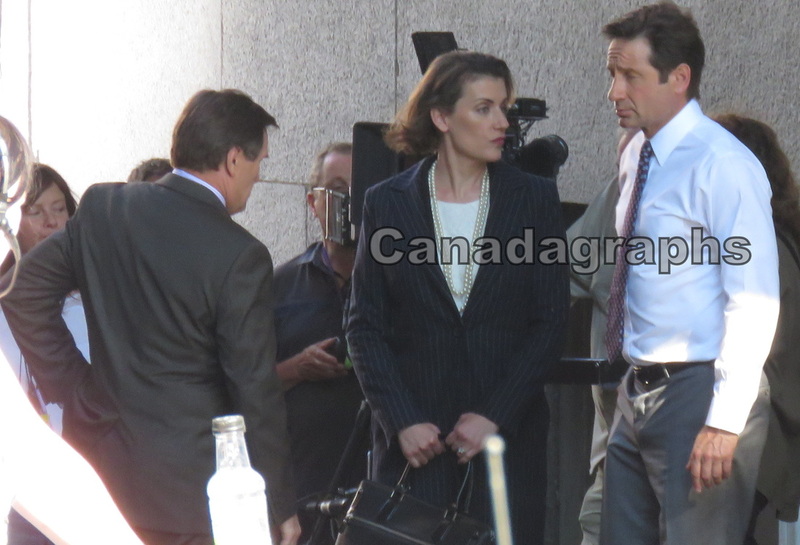 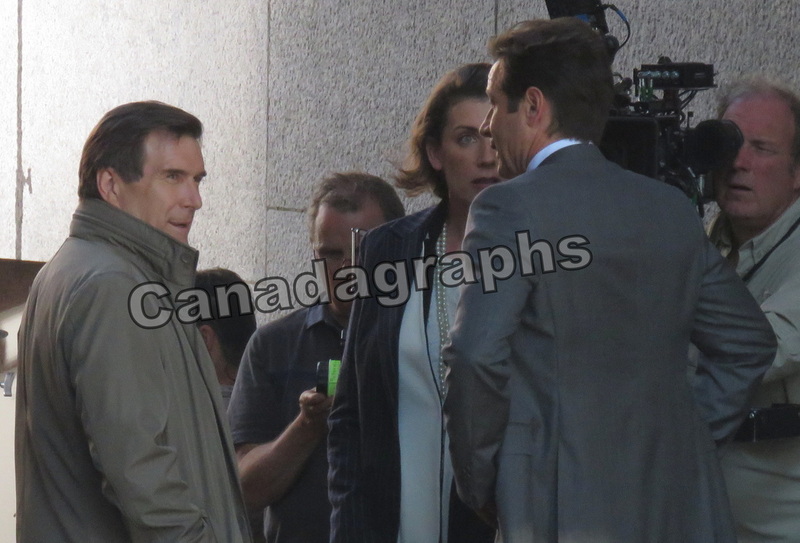 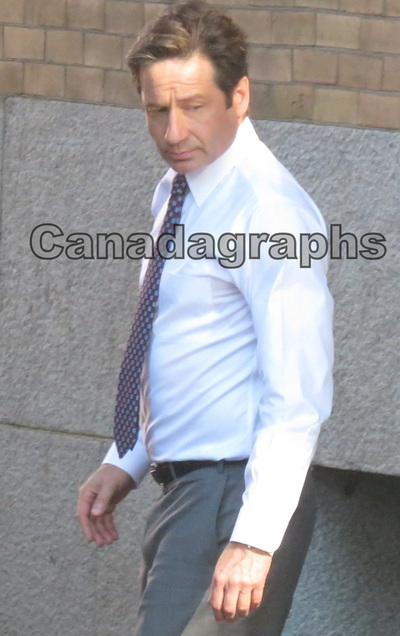 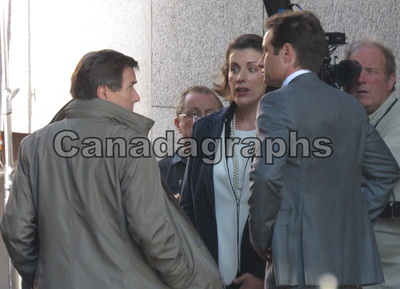 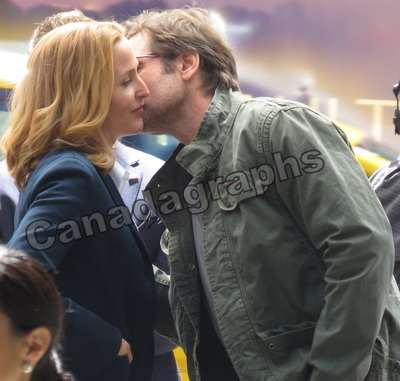 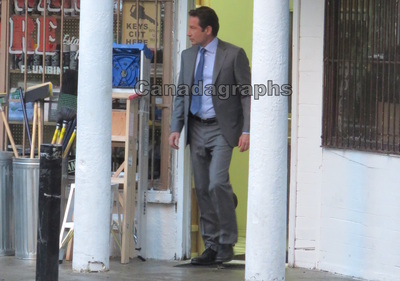 The X-Files shot scenes for their revival series a few weeks ago in 1 of the dirties places in all of Canada with one of the shows stars, David Duchovny. 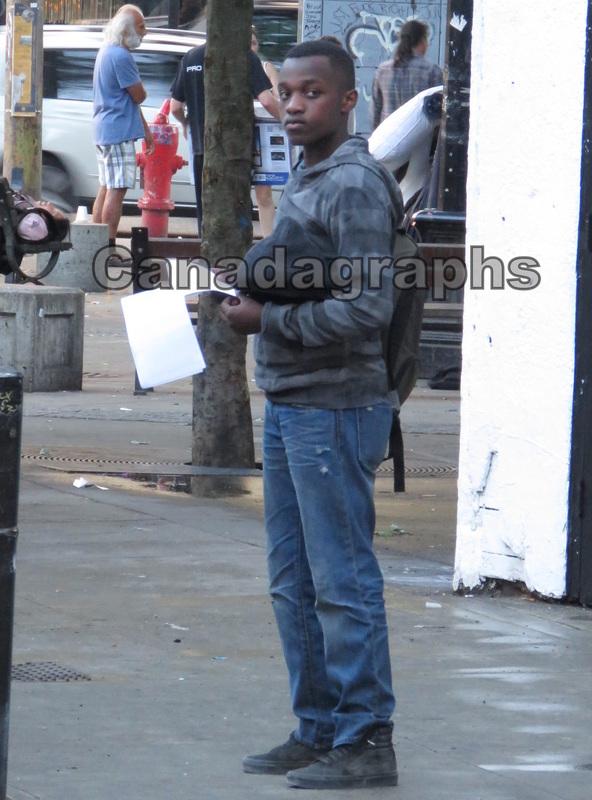 Carrall street, in the heart of the Downtown Eastside is 1 of the most unappealing places you'll want to spend any amount of time at. 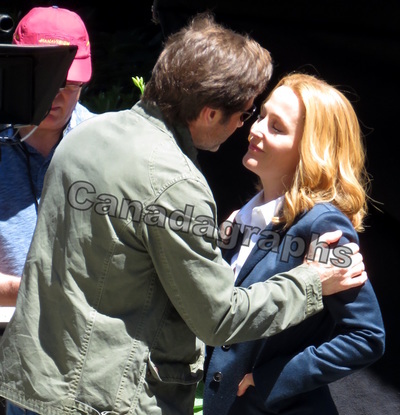 So I suppose its no shock then that the crew for The X-Files, and its star spent almost no time there filming a scene that they only did 3 takes of. In the scene, David, as Fox Mulder comes out of a door after a younger black man comes out it. 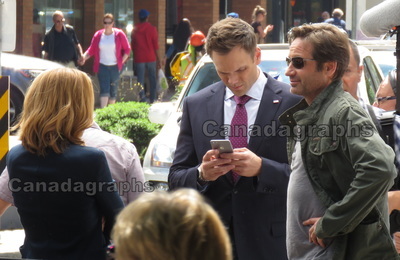 Mulder looks across the street, whistles at "someone" who is off camera that he seems annoyed at before he follows on foot after the man that came out first. David spent MAYBE 15 minutes total there, and 2/3 of that was waiting to do the 1st take. 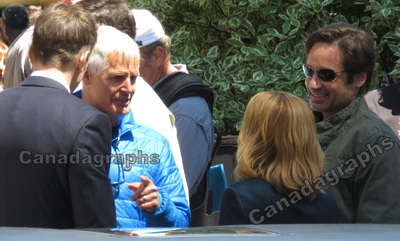 Once he got his takes in, he got out of there as fast as he could, but did stop long enough to sign an autograph for me before he got into his shuttle and left...and who could blame him. 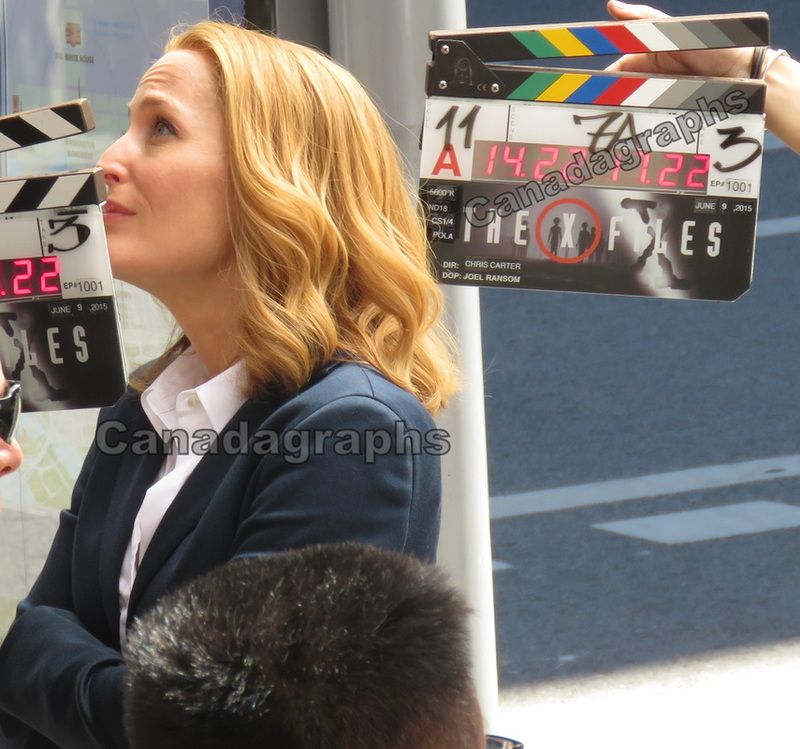 The stench of weeks or months worth of urine smell that had been slightly dormant, was revitalized there when the crew washed down the street for the scene, which only made an already terribly unappealing block much worse in the heat. A couple days later, a scene was being shot across the street from Victory Square in downtown Vancouver for The X-Files. 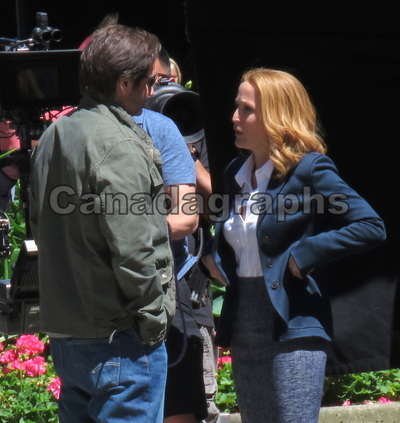 This has been a popular filming location for years. Its pretty rare for something NOT to be filming in that alley at least once every couple weeks. 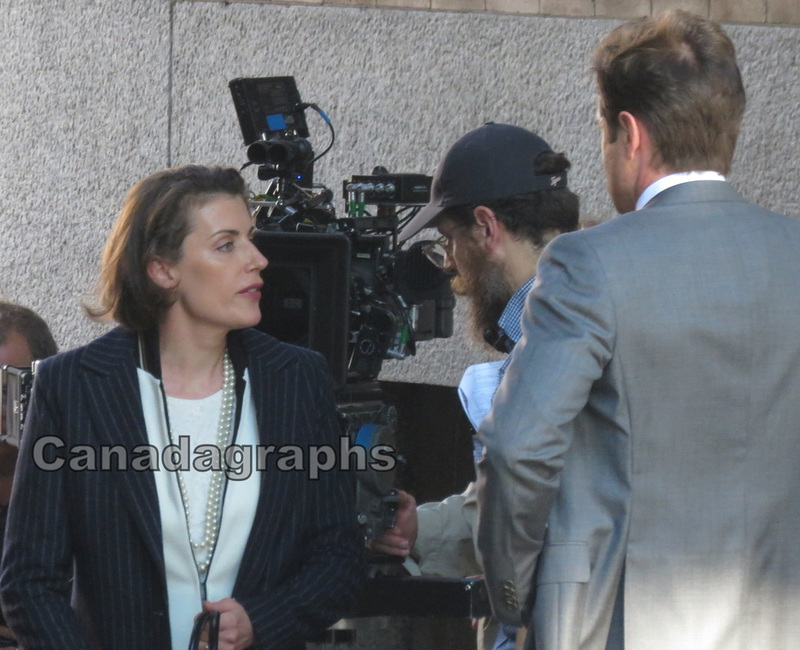 In the scene, 2 currently unidentified actors (if you know them, please let me know so I can correctly credit them.) 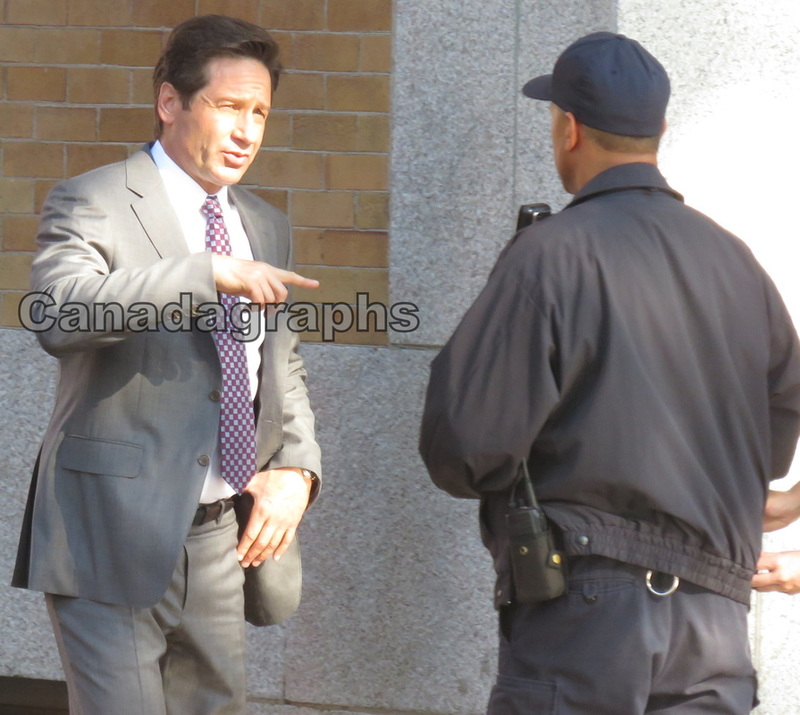 were talking part way down the alley before David as Fox Mulder comes up to them, flashes his badge & joins in on the conversation. 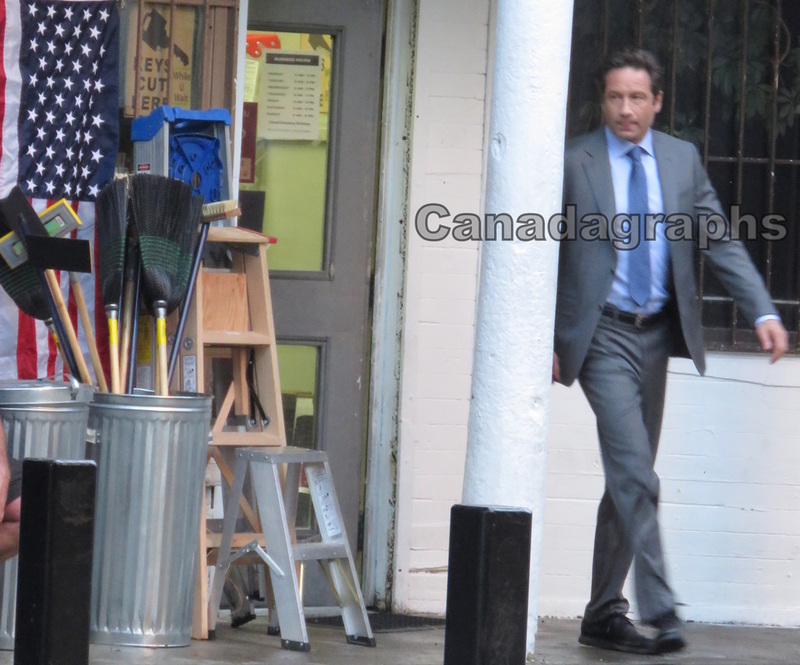 They had a homeless encampment set up across the street at the top of the alley. 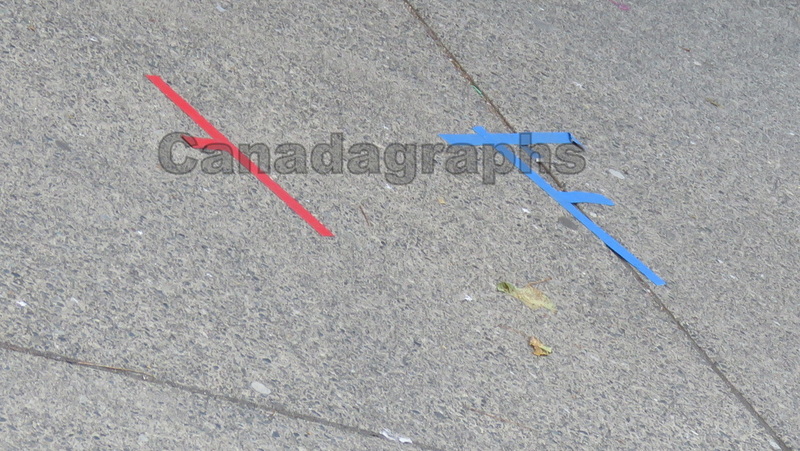 Lots of the regulars to sets joked that they could have saved the $ of a set designer & just had the frequent amount of homeless already in the park set up there. 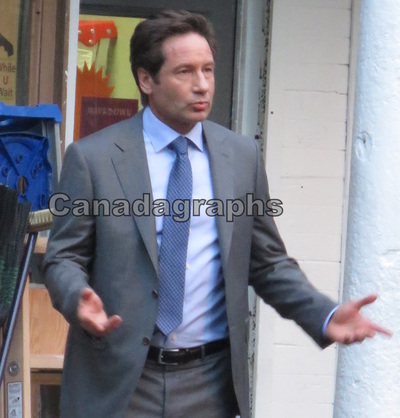 After that scene ended. There was a long break as they set up for another scene. I called it a day. 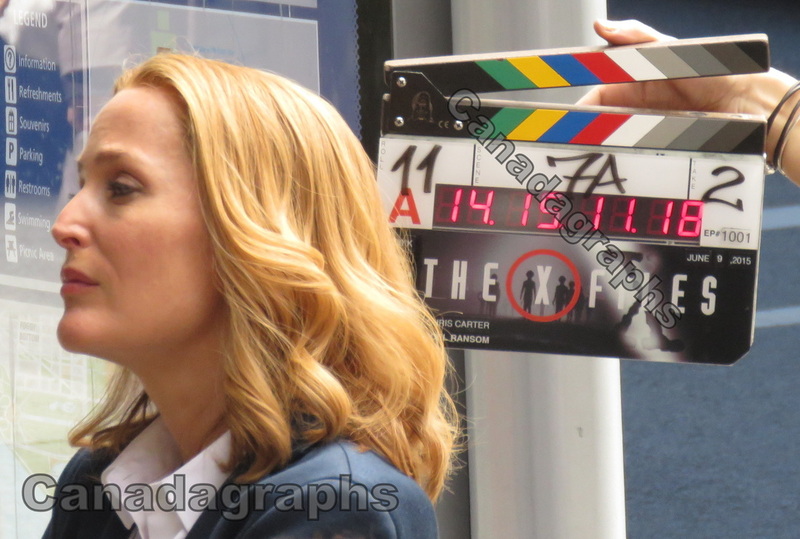 The X-Files Revival series will air on FOX this January 2016.. 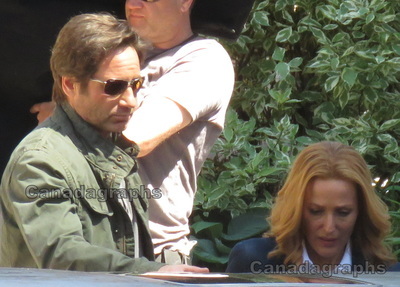 The X-Files were coming back. 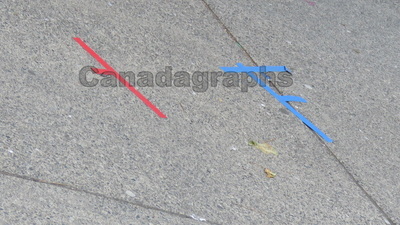 A 6 episode mini-series of the iconic sci-fi show that, along with 21 Jump Street is responsible for much of the film industry in Vancouver even existing was going to return here to shoot a quick 3 months of work for a 6 episode season. On this day The X-Files cast and crew, many of whom were on the original production some 15+ years ago, including the shows creator Chris Carter who directed the first episode had taken over a corner of West Hastings Street at the end of Howe Street. 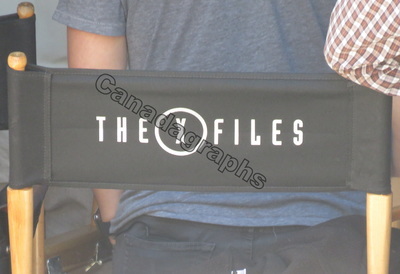 It is a popular filming location, used by many productions over the years, most notably seen in the opening credits of The Flash week in & out, and for me its best known as the place where the lead character of Dead Like Me dies in the shows pilot episode from a toilet seat that falls from the sky (Wonder if that's what Scully & Mulder are looking for when they look up). 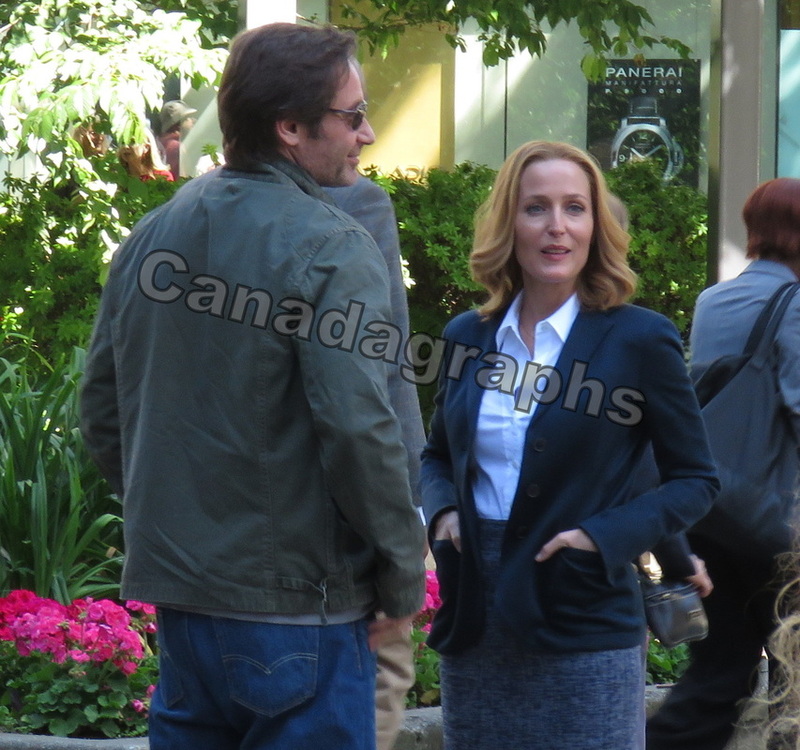 The scene seemed to entail Dana Scully (played by Gillian Anderson) waiting on a sidewalk for her former partner Fox Mulder (David Duchovny) to meet her there. 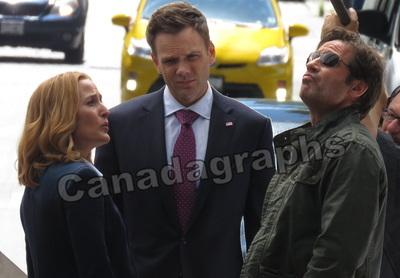 Once Mulder arrives, the pair exchange some small talk, Fox gives Dana a kiss on the cheek, and they continue standing there until they are joined by newcomer, Tad O'Malley (Joel McHale). 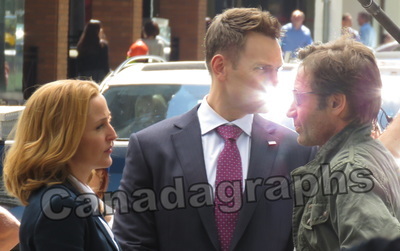 O'Malley seems to have a lot to say to the pair, and at one moment Scully & Mulder both look up into the sky, and by their reactions, it seemed they were at the very least willing to listing to more of what Tad had to say as they follow him into his limo & left with him. 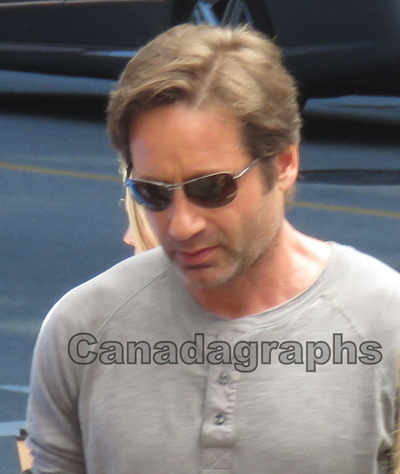 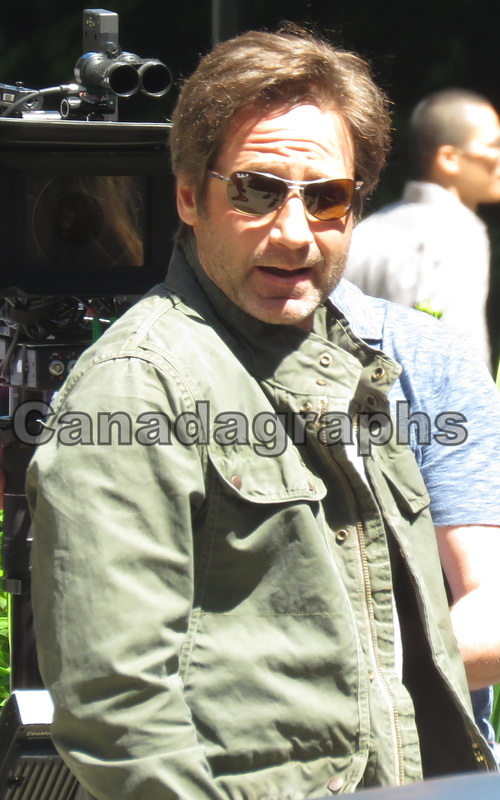 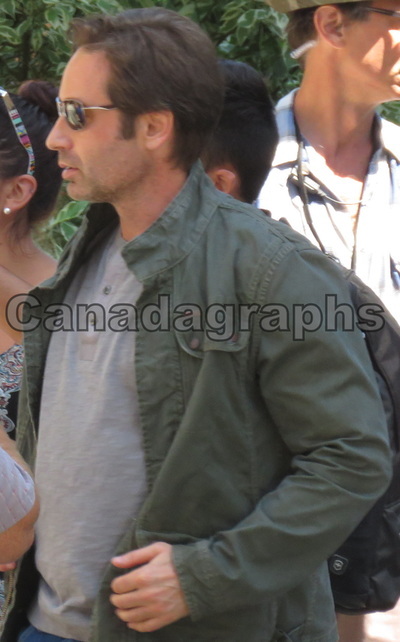 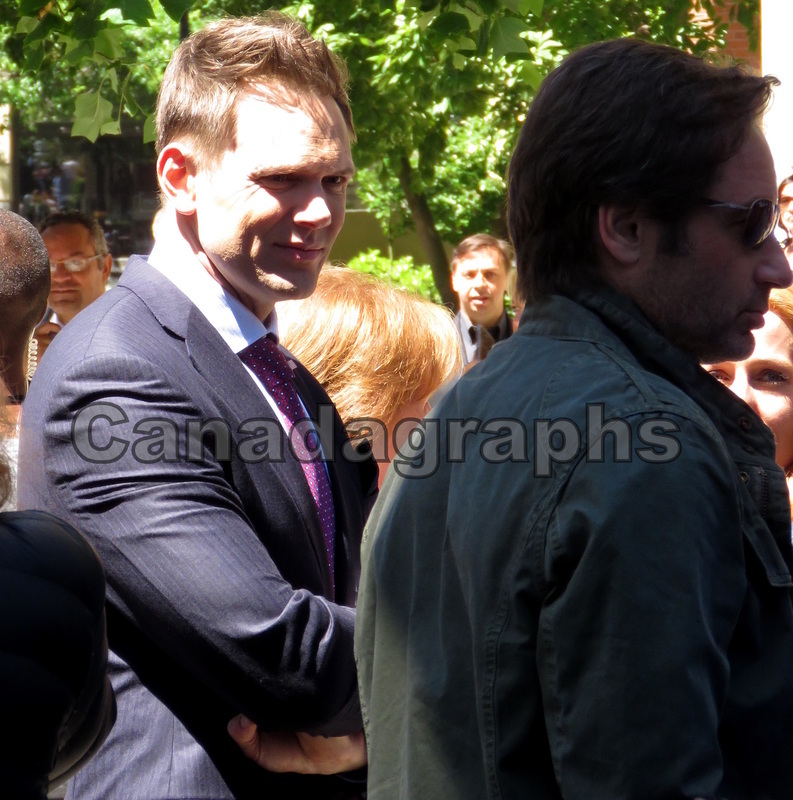 David Duchovny was on set the 1st day. 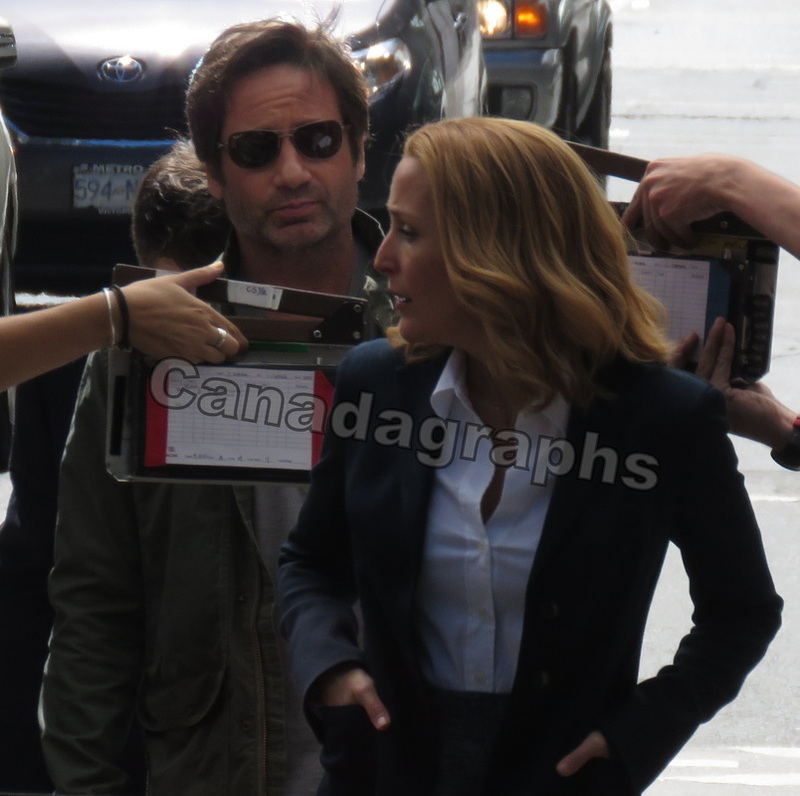 The man who created Fox Mulder was back playing him a couple weeks after the 13 year anniversary of the show ending. 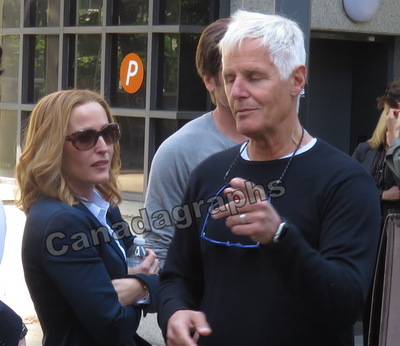 The 2 time Golden Globe winner, including once for The X-Files came back to the role that put him on the map. After the success of his cable series Californication, and his current limited series show Aquarius, Duchovny could have probably turned down the reunion, but opted to take it. Loyalty to the show that made him a name? 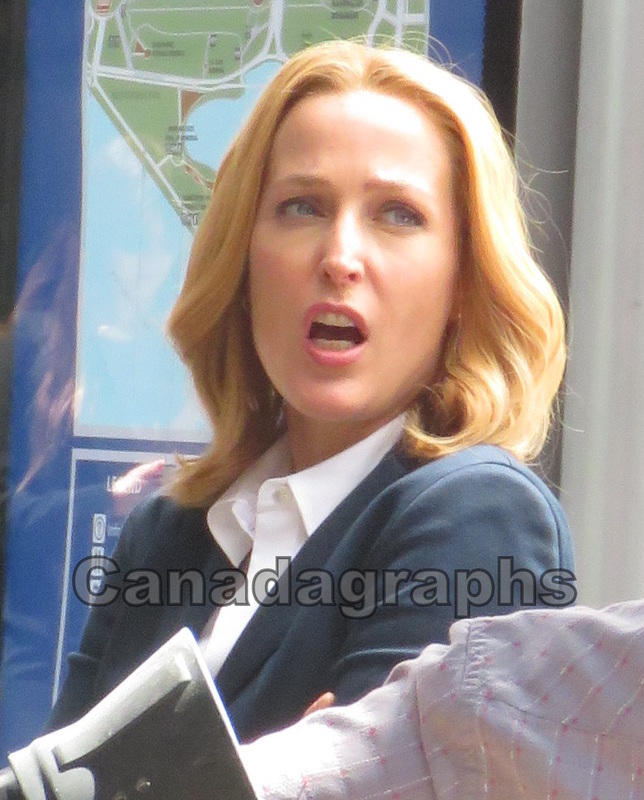 Or just really wanted more work? Who knows. 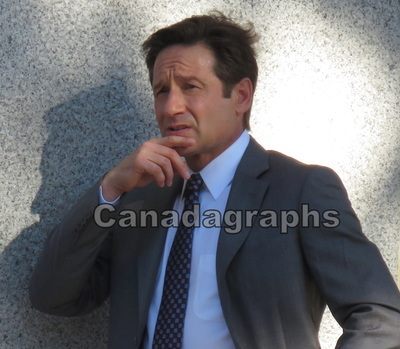 Dressed in casual wear for this shoot, it seems Agent Mulder has left the suit & tie look in the past (for now) in favour of a more casual civilian look. The scene starts with Fox getting driven up to a corner where he exits a car that drives away and meets up with his former partner Dana Scully. 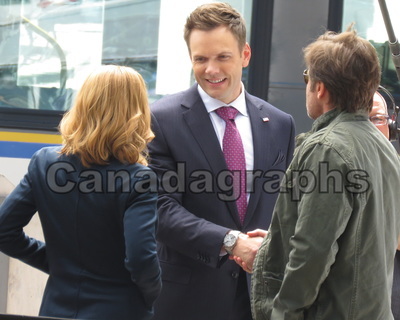 The pair exchange pleasantries, which includes Fox kissing Scully on the cheek, before they are joined by Joel McHale's character Tad O'Mallley. 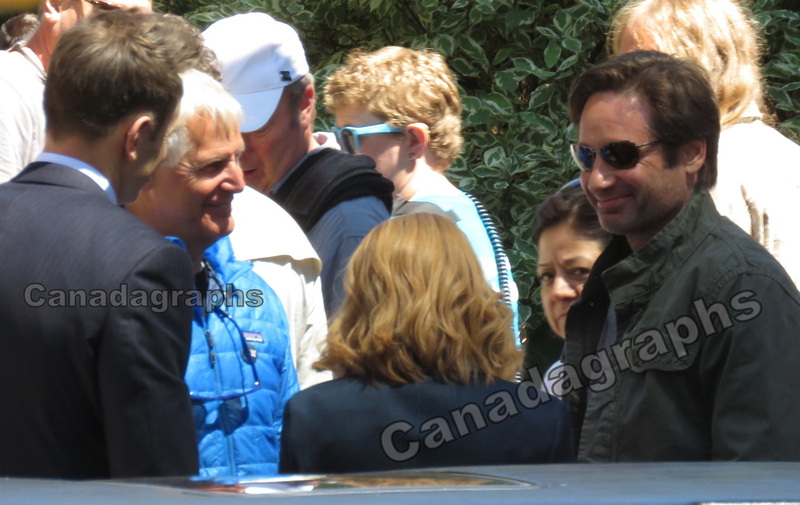 During long breaks, David would generally go to the holding area they had inside a side room at the prestigious Vancouver Club. 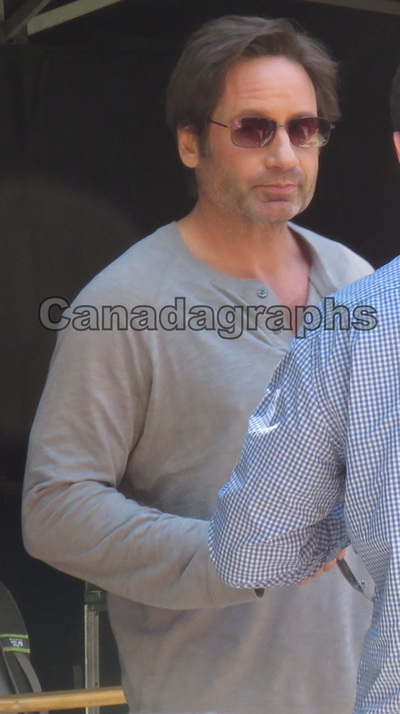 While David never stopped to take photos or sign autographs, he at least responded when asked with "sorry not now" a couple times. 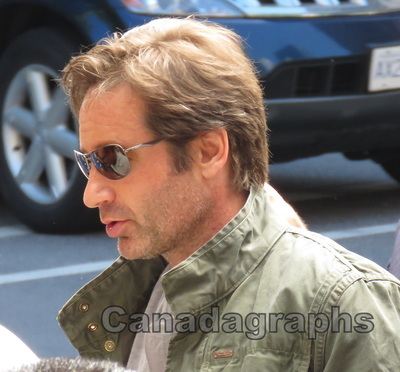 When he was here in the 90s, David of course got a lot of flack from the media about his disdain for our weather. 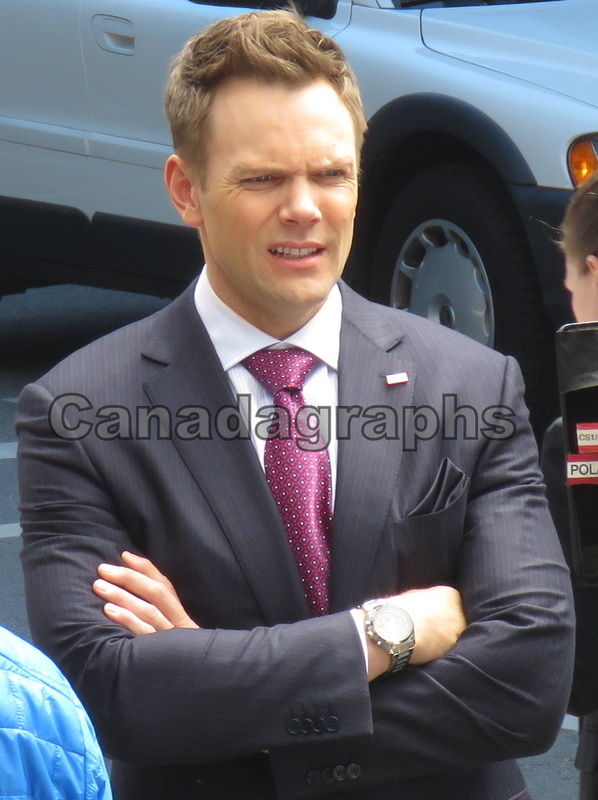 He was seen as the reason the show moved, and inevitably, the reason it failed once leaving here. 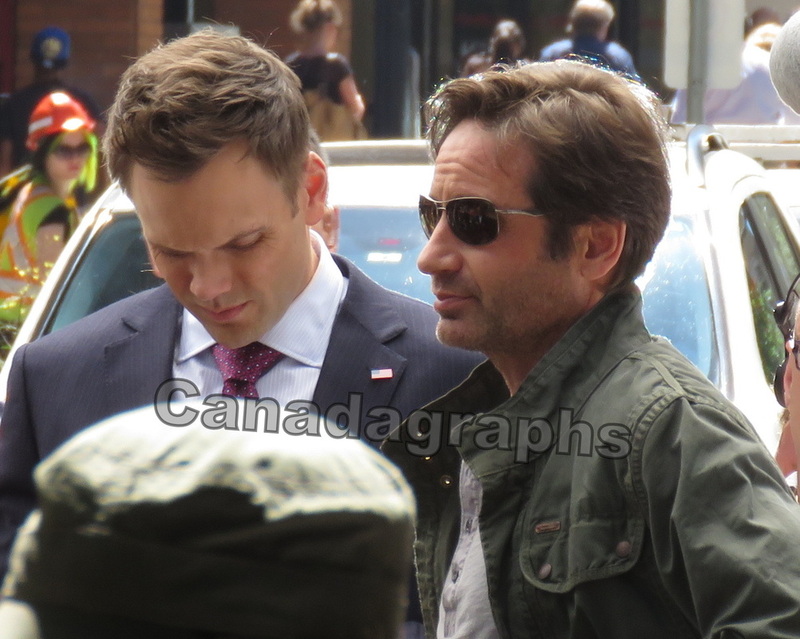 One thing I can say about him however is, he was usually pretty nice with fans & regulars. 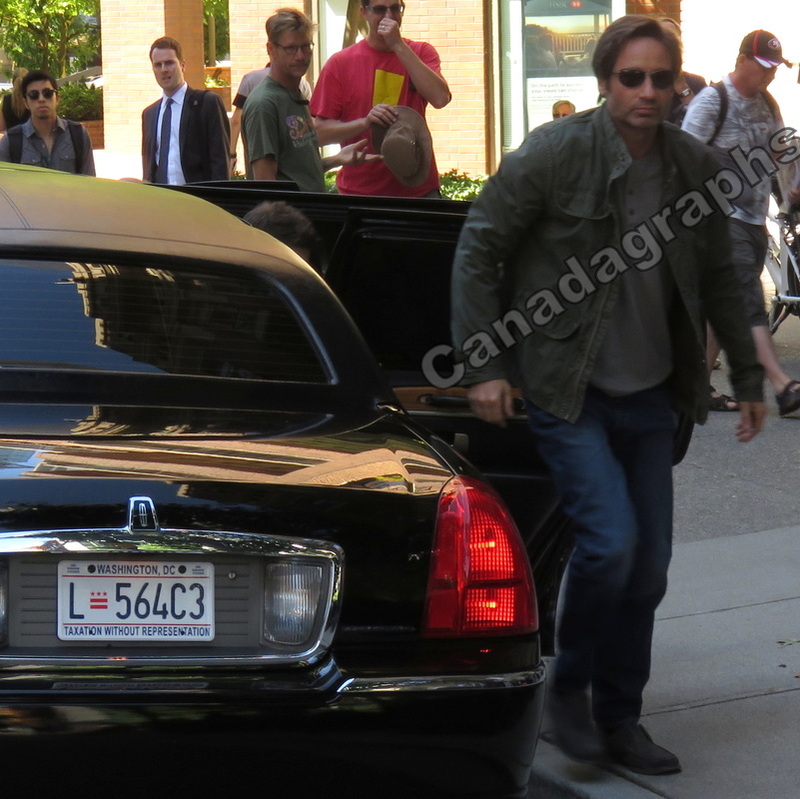 He even 1 day had his transportation vehicle pull over, rolled down his window, yelled at me, and when I turned to see who it was/what they wanted, he waved me over, and signed. 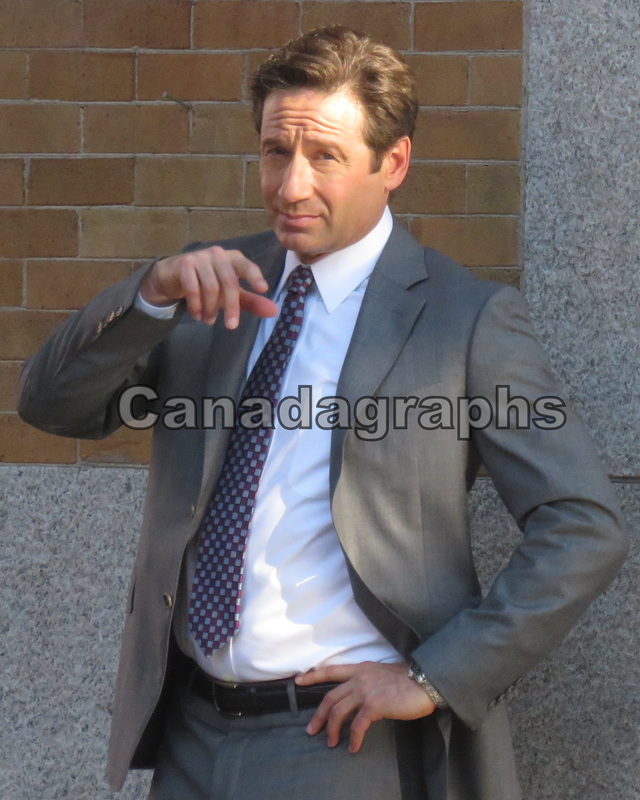 Heres hoping THAT David returns as the shoot goes on. 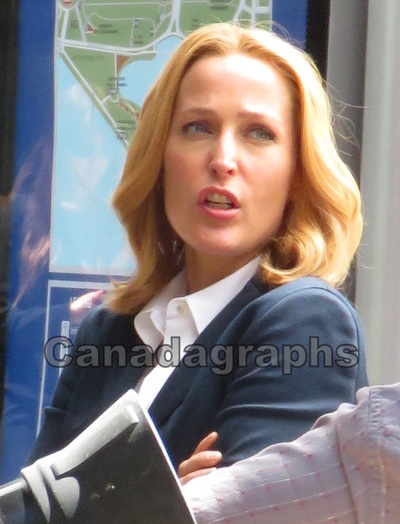 Gillian Anderson returns as agent Dana Scully. The 1997 Emmy and Golden Globe Award winner for this role, Anderson returned looking as professional as her character looked back during the original series. 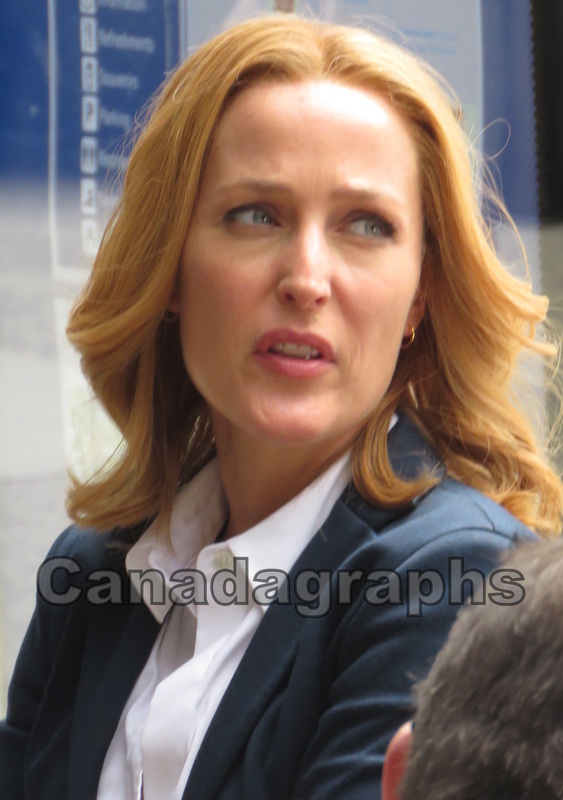 With very few notable roles since the show went off the air, this revival cant come soon enough for Anderson whose most notable role since the show ended was a recurring role on the recently canceled Hannibal. 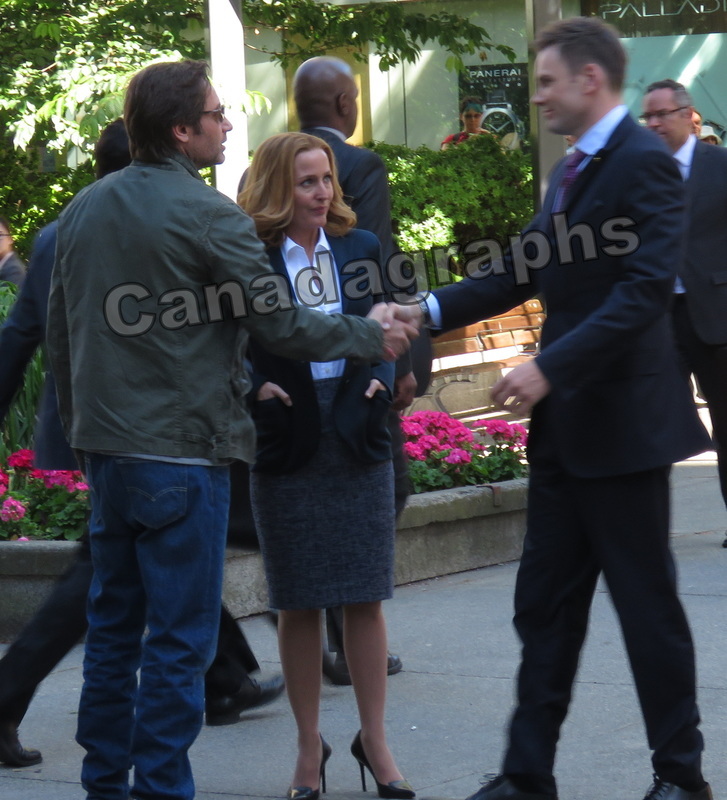 The scene starts with Scully standing on a sidewalk by herself before Mulder rolls up and greets her. The two exchange pleasantries before McHales character joins them. During the long breaks, like the rest of the cast. Gillian would scurry into the holding area, trying her best to avoid even responding to fans who stood there for hours hoping to meet the stars. 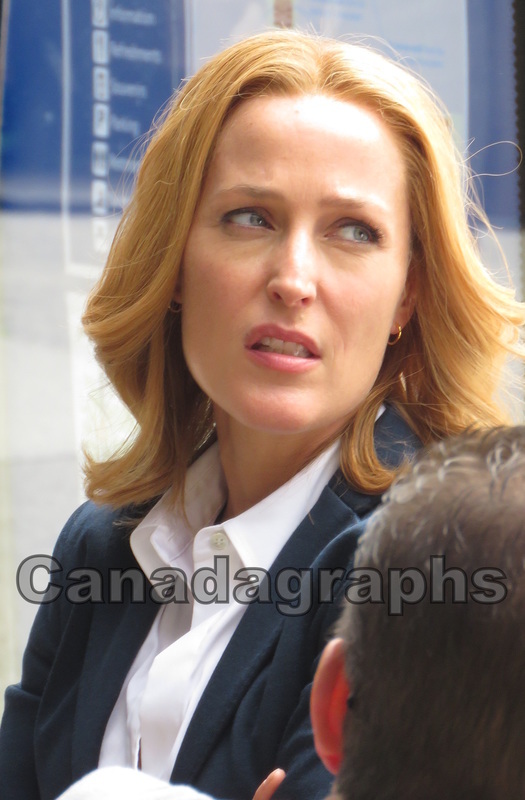 The friendly & relaxed Gillian I recall from the early-mid 90s seems to have been replaced with this less pleasant shell of herself. Hopefully the show will be good for her, and her crustiness will erode with some success. 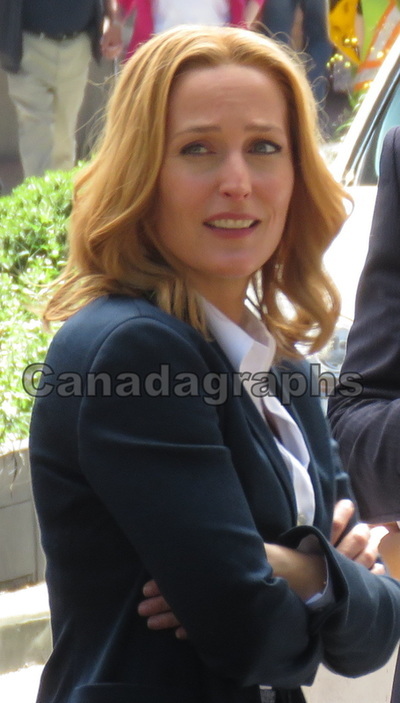 I'd say it could have been a 1 off bad day, but I had heard several reports from multiple places before they got here that this is what shes like all the time now. 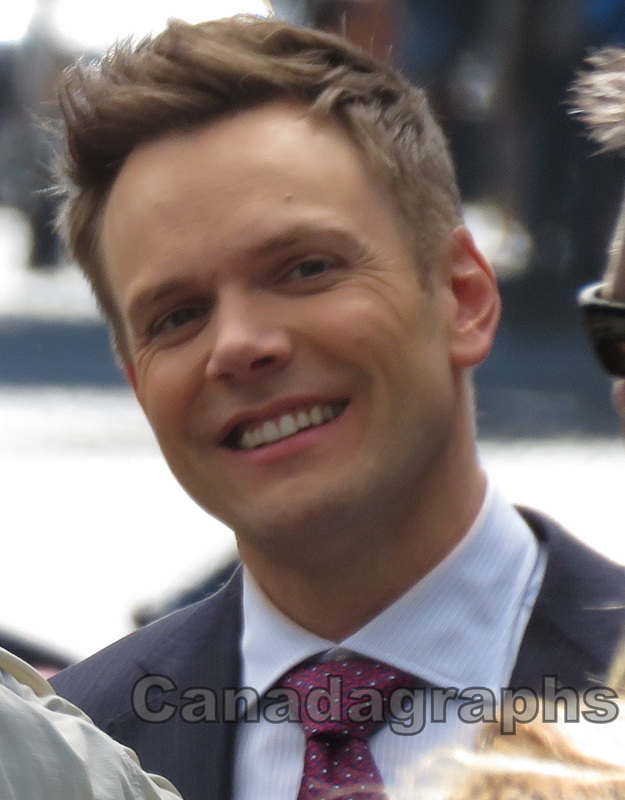 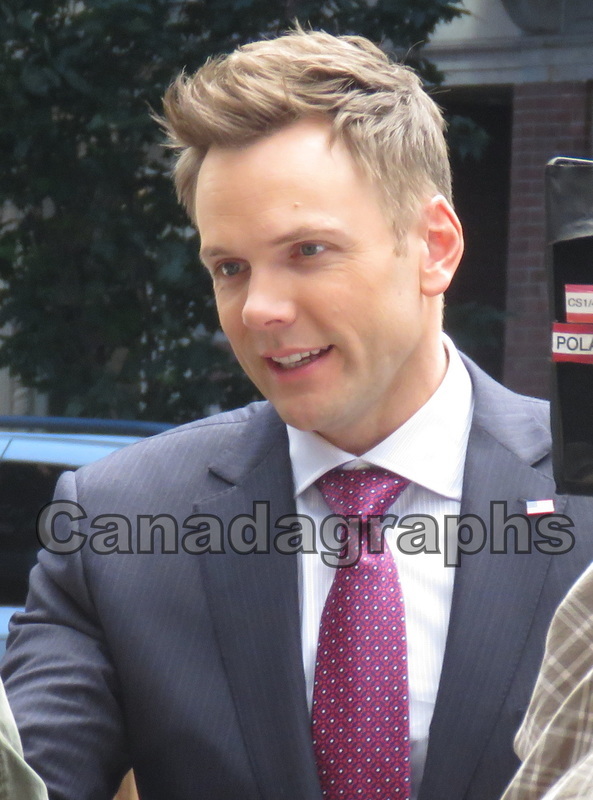 Joel McHale, the newcomer to the series brings a strong resume that most notably has his 6 seasons (and hopefully more...maybe a movie) of the hit NBC/Yahoo comedy "Community" to the cast. 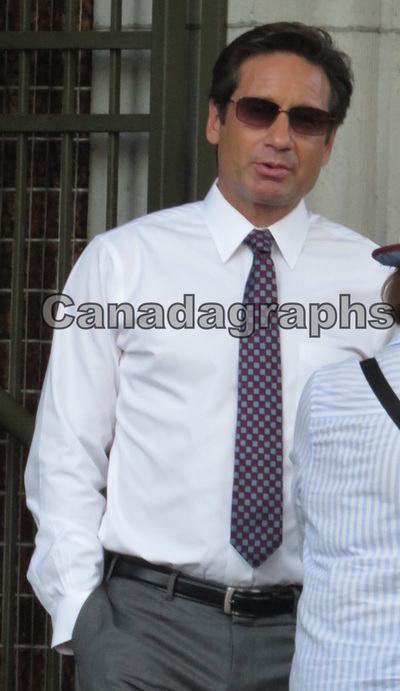 His character a news anchor for a conservative website, Tad O'Malley will surely play a prominent role in this season. On this day McHale's character Tad drove up in a limo, he gets out and introduces himself to Scully & Mulder. A conversation then ensues with the trio that leads Scully & Mulder to look around above them as if to see if a UFO were overhead. 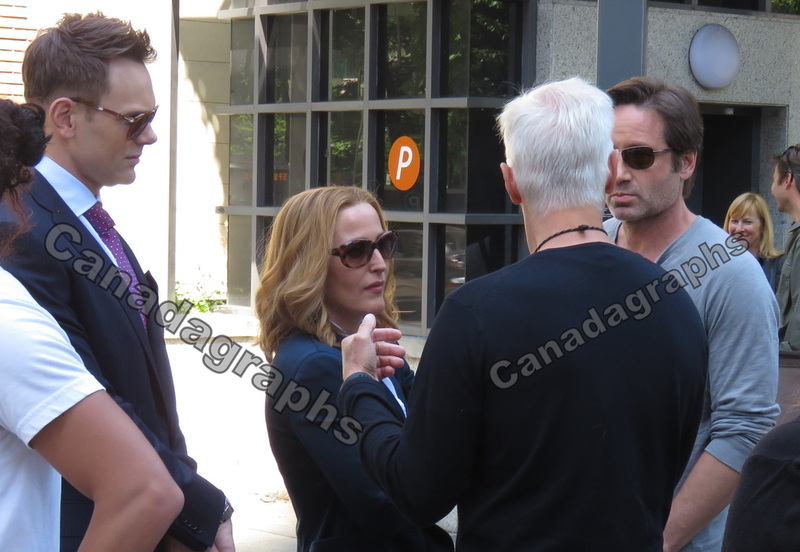 The scene ends with O'Malley leading Scully & Mulder to his limo & they all get in & leave together. 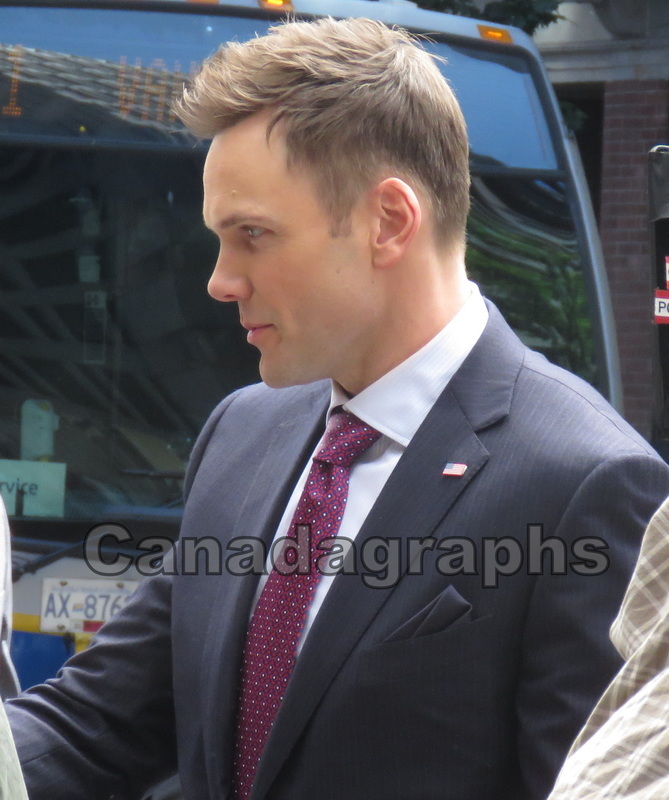 During breaks from the scenes, McHale, unlike the shows longtime leads, stopped to met fans & sign autographs multiple times. 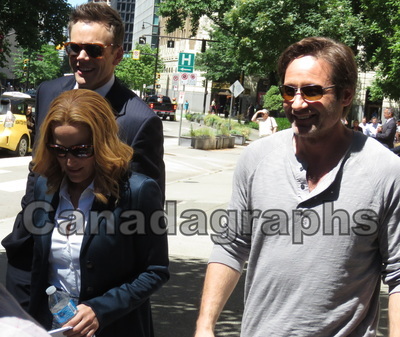 Giving the dozens of fans that had congregated there some good memories of the cast from that day. The X-Files Revival series films here till August 30, 2015. The premiere date for the shows return is tentatively scheduled for January 24, 2016 on FOX. 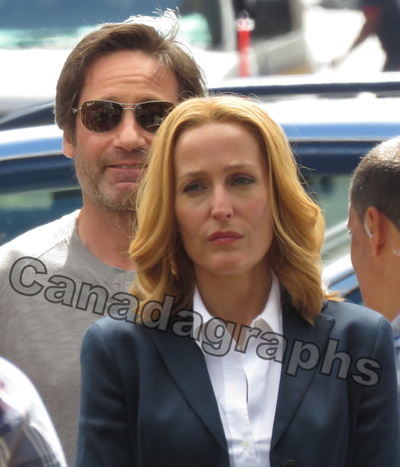 Here you will find write ups on production, and cast interactions with, the X-Files Revival television series.